Paterson (Adam Driver) is a bus driver in the city of Paterson, New Jersey. Every day he follows the same, simple routine - all the while observing the city and overhearing the fragments of conversation that swirl around him. The comedy, sadness and beauty in each day inspires Paterson to write poetry about his life and experiences. Following his performances in Midnight Special, Silence and, of course, Star Wars: The Force Awakens, the words “starring Adam Driver” are now more than enough to draw me into any film. Combine them with “written and directed by Jim Jarmusch” and I'm in - I’m all in. I had high hopes, therefore, for Paterson. Thankfully, the movie more than lives up to my lofty expectations. This is a beautiful and unexpectedly funny film, featuring a truly mesmerizing performance from Driver. I love so much about Paterson it is difficult to know where to begin. Let's start, then, with the film's rhythmic structure. This is a movie about a poet that feels genuinely poetic. I loved following Paterson’s daily routine (getting up, going to work, coming home, walking the dog, having one beer at a local bar) over the course of a week. Indeed, I started to anticipate his patterns - so much so that the smallest fluctuations in his routine made me feel anxious. There is real drama in these small, wonderfully observed details - details that push a story more concerned with simple routines (and the beauty inherent in a box of matches) forward. It is fascinating to watch Jarmusch reveal Paterson’s creative process. We see him observing everyday objects and writing his thoughts down. He then makes small changes to words or phrases until he has created something truly poetic and really rather beautiful. However, Paterson would never call himself a poet. He even resists making copies of his work. As a result, we experience his poems via Driver’s wonderful, natural narration and by reading them on screen. This technique could, in lesser hands, have felt cheesy. However, we are not dealing with lesser hands here. Driver’s performance is hypnotic. His face is a picture of calm - all emotion subdued. However, when his feelings (of humour, fear or grief) break through they pack a significant emotional punch - revealing the surprisingly intense passion within. These deep feelings are largely inspired by his wife, Laura (brilliantly portrayed by Golshifteh Farahani), a wonderful character who is infectiously optimistic and endlessly creative. Jarmusch creates a gorgeous, intimate portrait of a marriage - an enduring relationship built on love and support. 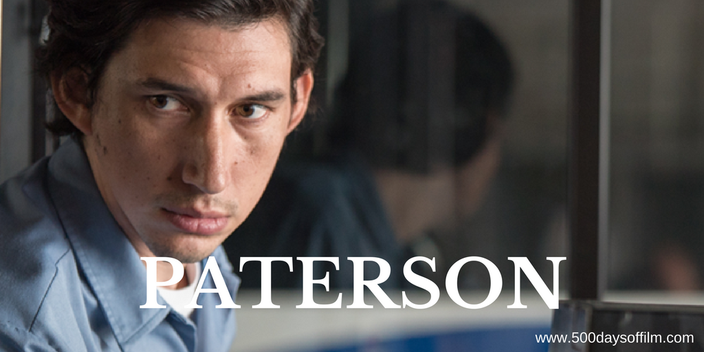 Paterson takes the life of a seemingly ordinary man and makes it truly extraordinary. I loved it. I couldn’t finish this review of Paterson without mentioning the marvelous Marvin. What a dog! Paterson is now available to watch on DVD and via Amazon Prime Video. If you have, what did you think of Jim Jarmusch’s film? Let me know by leaving me a comment in the box below! 1. Paterson interacts with twins on each day, sometimes directly. One of Laura's dreams involves the two having children who are twins. Is this some kind of suggestion that Laura's dream will come true? Or maybe that Paterson was seriously affected by her dream, and now discovers twins all around him, in a kind of frequency bias? Maybe it is just a symbol for similarity, identity, or variation? 2. Paterson's own work appears written on the screen. When reciting the poetry of others, it does not. 3. Is Paterson's refusal to copy his poetry a hint that he feels inadequate as an artist? Writing the poems for himself and those he cares about is fine by him, but he never shares his love of poetry with his coworkers or friends. Once they're gone, maybe he's prepared to move on to something else - until he runs into the man at the end. 4. Something is definitely going on with Laura black and white aesthetic, but I don't know what. 5. Paterson's "super power" to wake up, without alarm, at about 6:15 every morning is a great device. Then, as he begins to falter in one way or another, this is disrupted. It definitely builds tension in an unexpected way. Thanks for reading and leaving your fascinating observations. I agree about the twins thing and found Paterson's reluctance to copy his poetry really poignant. I loved his ability to wake on command as I also have that super power... however, I do still have an alarm - just in case!